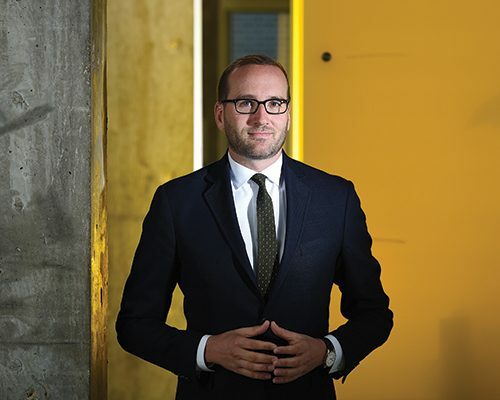 In June, Human Rights Campaign (HRC) President Chad Griffin held a community conversation at WOOFS to discuss their efforts to mobilize LGBTQ and allied voters across the state. Before the event, I had a chance to sit down for a one-on-one with him to ask about those efforts, and to give him an opportunity to hear some of the apprehension our community has had in the past toward the organization. We addressed the HRC’s goals in Wisconsin, their recent work in other states, and the progress they’ve made in centering marginalized LGBTQ identities both in their staff and in their priorities as an organization. What are some of the current priorities for the HRC? Something that we have prioritized is organizing and mobilizing the LGBTQ voter block, and our allies. And it’s important to put some definition around what the LGBTQ voting block is, what we look like and how we turn out. To do that, let’s go back to the 2016 election: Five percent of the electorate identified as LGBTQ. That means five percent of the electorate walked out of the polling station in a swing state and told a stranger that they were LGBTQ. So, worst case is that we’re five percent of the electorate. We’re at least 10 million eligible voters in the country today. That’s larger than the margin of victory of every presidential election since 1984. And then you look at states like the state of Wisconsin, which is a priority for a host of reasons. When you look at the margins with which the last presidential election was decided here, our community, when organized and mobilized, can decide the outcome. What is an example of HRC’s recent track record for mobilizing the LGBTQ vote? In 2016 we prioritized North Carolina, where Pat McCrory had attacked our communities, thinking it would ensure his own reelection. In the nine months we had from the time he signed the bill until election day, we organized and mobilized not just the LGBTQ voter in that state, which is about a quarter of a million, but also the allied voter there, too. We organized and invested in that state, and on election day when Donald Trump unfortunately won North Carolina by nearly four points, for the first time in the state’s history, the Republican incumbent governor lost his race. Fifty-seven percent of North Carolinian voters in that election said that the anti-transgender HB2 was the single voting issue for them. So what are the HRC’s 2018 election goals? In midterm elections, historically there is tremendous drop-off, whether its LGBTQ voters, or voters of color or single women voters. And this is the year that we have got to ensure that we have tremendous turnout. Both from our priorities in state legislative races, statewide races, and then protecting Tammy Baldwin, the single-most targeted Democrat in the United States Senate. That is the reason that I’m here today; it’s the reason that we have full-time staff on the ground here, and across the state. Looking at the 2016 election breakdown, are you able to specifically tell who LGBTQ voters voted for? Two-and-a-half percent of the electorate identified as Jewish. LGBTQ were at five percent, and then Latino and African American were 11 and 14 percent respectively. The LGBTQ voting bloc was one of the only voting blocs that did not decrease our turnout, we slightly increased. But we also showed tremendous change from the Obama/Romney election to the Hillary/Trump election in terms of shift in vote for the pro-equality candidate over the anti-equality candidate. Is the presence here just an election push? Obviously, most political organizations and political campaigns only have the resources historically to go in a few weeks into campaigns and spend resources. We intentionally made the decision, post the 2016 elections, that this is one of six states that we were going to be investing in and going deep, that this was an investment with an eye towards state legislative battles, statewide races, and federal races in particular, but also with an eye toward and organizing for 2020. What do you think is the likelihood of not just flipping, but installing pro-equality, or even out candidates? In my time in politics, I have never been more optimistic about where we’re headed. That’s cautious optimism. I’m optimistic because I have never seen the kind of energy that we see today, and whether it’s our work in North Carolina or several months ago in the Alabama Senate race. We prioritized organizing in Alabama and have had offices there for five years now. Years ago, we put full-time organizers on the ground in Arkansas, Mississippi, and Alabama, knowing two things: one, we had opportunities to pass protections. Perhaps not at the state level initially, but in cities and municipalities across the state. For instance, we just passed protections in Birmingham, Alabama, and Magnolia, Mississippi. But we also made that investment knowing that the south is changing. And that in a place like Alabama, if we’ve gone back a few years, folks would have never said that we would have a pro-equality United States Senator from there. In fact during that election some folks said yeah, but when Doug Jones gets to the Senate, is he actually going to stand up? Three months after taking the oath of office, Doug Jones became the 245th cosponsor of the equality act. What does the HRC’s outreach plan look like in Wisconsin? Typically when people see the HRC, it’s only at events like Pride. We will still be at several hundred prides across the country. Signing up members, registering voters, signing up volunteers. Separate from that, we have full-time political and grassroots organizers on the ground in Wisconsin that are focused on organizing and winning elections. We have an incredible base to start this work on. We have 150,000 estimated LGBTQ people in this state, and I always give the caveat that that is a very low estimate. In addition to the estimated LGBTQ voters, there are also more than 500,000 equality voters (which are included as allies), people that we’re able to target and mobilize in support of our endorsed candidates and issues. I want to ask about some perceptions that our readers have regarding the HRC. The most common is that the organization prioritizes rich, older, white men. How is the HRC centering intersectionality, or other marginalized identities within the LGBTQ community? It’s a critically important question. I appreciate you asking. It’s also a critique that I’ve heard before, and that I take seriously. We’ve made tremendous progress. No organization can fully represent a community unless the staff and volunteer structure adequately reflect the broad diversity that is our community. The LGBTQ community is as diverse as the fabric of this nation. And we have to ensure that our staff reflect that. We’ve made a tremendous commitment, both on the ground and at the leadership level. I think it’s especially important as a white leader that I not just state big, lofty goals with good intentions, but that I’m held accountable—that I actually show measurable progress on this, so I’ll share some of the progress we’ve made while also acknowledging that we have a long way to go, both as an organization and as a community as a whole. Of the 60 new hires that we’ve made over the last 12 months or so, 45% of those have been people of color. Twelve percent are transgender and gender non-conforming. Today, people of color are reflected at every level throughout the organization. We have continued to also look at our programs to ensure that all HRC programs, both on the political and foundation sides, are representing the most marginalized among us, and that we are reaching into the communities that need this work the most. Also, 50% of our organization is female; all of my direct reports are women. There are a few things I would say to that. During the marriage battle we were also often criticized for doing too many things other than marriage. There was actually a lot more balance in the organization. For instance, about a year or so after I started, I pulled together all of the leaders of the national HIV and AIDS advocacy groups and service providers. I asked them, “What are you not doing that we should be doing?” Shortly after that, we launched a partnership with the Elton John AIDS foundation, and today we have an HIV and AIDS program that has a particular focus on gay, bisexual, and transgender African Americans in the south. Can you tell us more about some of HRC’s other coalition work, perhaps circling back to the 2016 election? We’re in locked arms with groups across a very broad coalition. And we had been doing that pre-election, but just to give you a quick story: On election night, I was in our North Carolina war room. I don’t remember what time it was; it was a fog for all of us. There was a point at which it was pretty clear where the national election was headed, but it hadn’t been called yet. I snuck out of our war room, went up to my hotel room by myself. For five minutes or so I think I was in a completely depressed state of mind. And then I pulled myself off the chair I was seated on while staring at the TV, and I picked up my phone. Cecile Richards (President of the Planned Parenthood Federation of America) was the first person I called at whatever time that was, 11, Midnight, whatever it was on the east coast. We had a conversation about 1) We’re all about to be under attack, 2) We all have to stand together like we’ve never stood together before and 3) Can you meet tomorrow? I was on a 6AM flight headed back to DC the next morning, meeting with coalition partners. The second person I called that night was Dr. Cornell Brooks, who at the time was the president of the NAACP. We had a very similar conversation. Within 24 hours, we were all in the same room with broader coalition partners. We made a commitment on that night that we all have to stand together across social justice movements. One, because if they’re coming for one of us, they’re coming for all of us. And LGBTQ people, we are Muslims. We are people with disabilities. We are DACA recipients and immigrants. Any one of these groups on our own have a hard time winning. We won the senate race in Alabama because of turnout, because of LGBTQ turnout, because of turnout from African-American women, especially. But our partnership in the state of Alabama was with the NAACP of Alabama. We were focused on voter turnout within our specific demographics and specific regions of the state. That’s how we win. The last thing I’ll say about that generally but then, more connected to our broader conversation: If you look at those who are attacking voting rights today, if you look at those who are going after transgender students, if you look at those who are trying to undermine heathcare and a woman’s right to safe and legal abortions. Nine times out of 10, with exceptions here and there, it’s the same elected official. At the local level, at the state level, at the federal level, and obliviously at the White House—and I don’t just mean who’s living on the third floor there, I also mean Mike Pence. We all have enemies in common. And that’s why in political campaigns, social justice organizations that take political positions and endorse candidates, by working together in these states and in these districts, it’s how we can oust the person that’s standing in the way of equality or a host of other social justice issues. I think maybe the last thing I want to say is while we are building the momentum for federal protections with the equality act—and that’s why these races are so important, so that we can win the votes in the House and Senate and ultimately have a President that will sign it into law—it means that it’s important to have protections at the local level and at the state level. And as you well know, this state was the first in the country, in 1983, to pass protections on the basis of sexual orientation. But Wisconsin still does not have a gender identity protection statewide. And so that is also part of the goal in winning these state legislative races, so that we can support, and in coalition with those who have been on the ground for decades working on these issues, to be able to collectively do the work it takes to pass and have statewide protections here. And then, someday soon, have federal protections and a president who will sign them into law.